After nearly a month of glorious rain, the fields have dried out enough to get back to planting. That means Royce is spending all day every day in a tractor cab until he finishes planting, and it also means I get tasked for lunch delivery to said tractor cab. Before I leave the house with lunch in hand, I always have to ask where he is planting. Yesterday, it was "Dennis's." Today, as I received his response of "The Sargent" and I automatically knew where to go, I realized I've come along way since this time last year. How is that, you ask? Well, I actually knew which field he meant and how to get there. If you are new to a farm or ranch, whether as a new girlfriend, wife, hired hand or husband, my advice to you is to learn your way around the farm and the ridiculous name of each field. The quicker you do this seemingly simple task, the easier the rest of your life will be. Oh, by the way, it probably isn't that simple. Get a tour of the farm and take excellent notes. Find a county plot book and highlight each field, adding a note for common referenced names. Or, you could just do like me and ask repeatedly which field/pasture they mean. You'll get it eventually. Let me share some advice with you. Field names most likely won't make any sense to you. Some farmers name fields by number, but most farms I've been on haven't been that easy. On my dad's farm, he uses a combination of random identifiers, like "The Mile-Long," "The Curves," and "Egypt" (because it was *ahem* out of the way), and last names of the people from which he rents or bought the ground. This was really great if you are around when the land comes into the farm. Not so great if you are new and have no idea who the people were. Here on the O'Neal Farm, we are very similar to my dad's farm. We have lots of family names, "Kuykendall," "Sargent," "Sheridan," "The Doss Place," "Johnny May's Home," "Johnny May's" (not to be confused with Johnny May's Home), "Aunt Ruth's," ... You get the idea. We also have some random identifiers, like "The New Well" (which is somewhere between 15 to 20 years old), as well as "The West Pasture," "The Middle Pasture," "The East West Pasture," and "The East East Pasture." Yikes. If you ask why a field is named something, you better be prepared for a good story or at least, a lesson in farm history. I once asked Granddad why "The East West Pasture" and "The East East Pasture" were named that way. He proceeded to tell me about when his grandfather acquired the ground, how and why he settled in the Texas Panhandle, and how all of his grandfather's land was divided up after he passed away. Eventually, he got to where he and my father-in-law had just decided to split the East Pasture into two pastures. It was really an awesome story and I thoroughly enjoyed the history lesson, but if you are in a hurry, just don't ask the question. Some fields are named after objects that are no longer there, so if you are looking for the "one tree" on "One Tree Field," you may never find it. Or, my favorite, there used to only be one tree on "One Tree Field," but now there are 10. Most importantly, if you don't know where you are going or how to get there, don't be afraid to ask, especially if you are delivering a part for a broken piece of equipment. While they might be slightly upset that you don't know your way around yet and they had to take a quick second from being broke-down to answer your call or text, they'll be very upset if you take the part needed to get the combine running to "The Curves" instead of "The Mile-Long," delaying the harvest by another 30 minutes. I speak from experience. Please, just ask! I want to hear from you! How do you name the fields on your farm? Have you ever had trouble remembering all the field names? 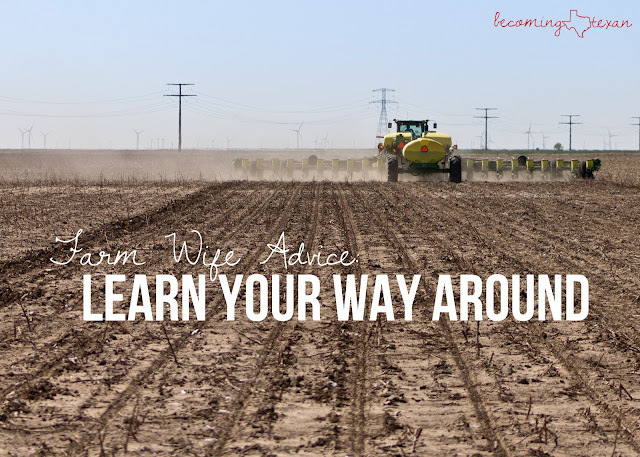 Has it ever gotten you an upset farmer? LOL! I literally laughed at loud at this... It is so true! Even though we've farmed plots of land for generations, it is still "so-and-so's" land. But plot books SAVED MY LIFE! I still don't know the field names... BUT at least I can find them!